Archaeological evidence reveals that woodland management of one form or another has taken place on this site for thousands of years. Many people once made their living in Ecclesall Woods, as it was a rich food source – for both people and livestock – and provided firewood, charcoal, and the materials for building and for making tools. The Woods were previously divided into numerous individual named woods, ranging in size from 2 to 18 hectares. These compartments were rented out for all manner of woodland industries and the legacy from all these different types of management define the Woods’ present day character. 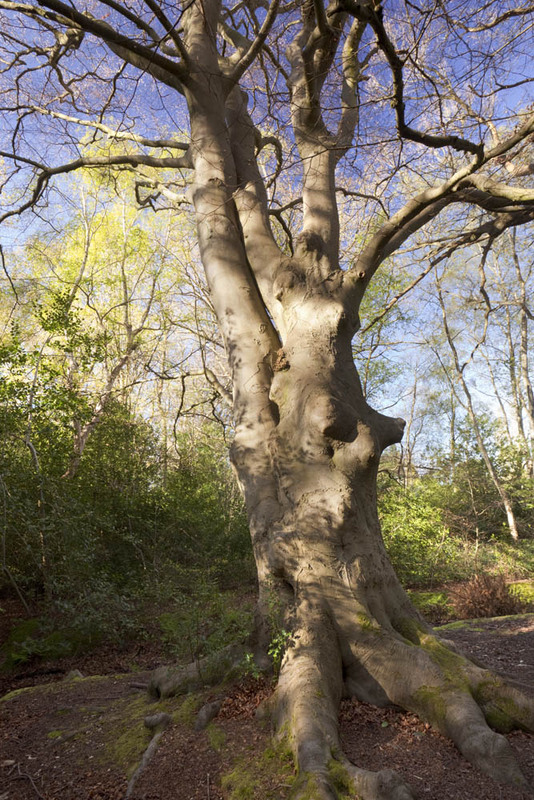 From the early 14th century until the mid-19th century Ecclesall Woods were known as a ‘spring wood’, a name given to coppiced woodland. Coppicing created the multitude of twin and multi-stem trees that are found throughout the Woods. Known as ‘small wood’, coppiced material was the mainstay of the industry here from the 1600 until the early 1800s. The process ensures a steady supply of wood and actually prolongs a tree’s natural lifespan. A hazel normally lives for around 70 years; when coppiced it could reach 300. The coppicing process begins when a young tree is cut back so only the stump or ‘stool’ remains. New shoots resprout from the stool and a certain number are selected to grow on, producing long straight ‘poles’ with many uses. Poles are harvested on a cyclical basis, the length of which depends on the species. Records from the Woods, dating back to the 1700s, indicate that harvests took place every 20 – 25 years. 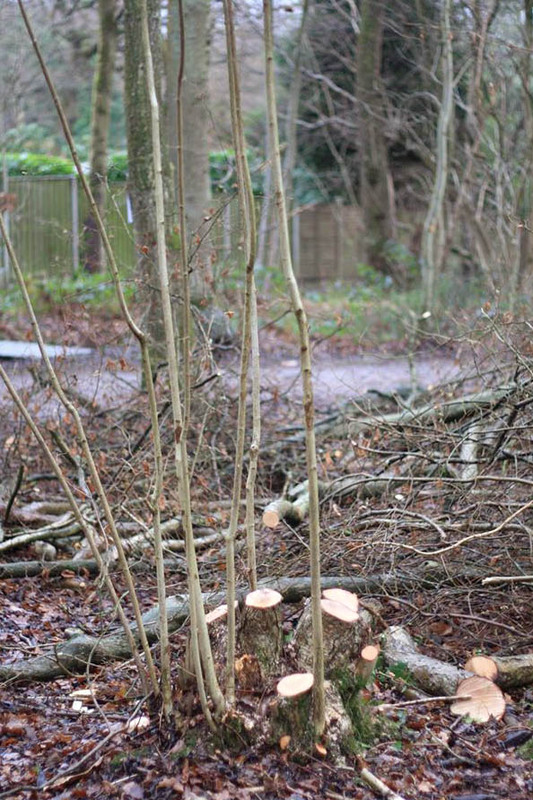 Coppicing needs to take place regularly as a ‘lapsed coppice’, a tree allowed to regrow for many decades, may be vulnerable to infection when recut. In Ecclesall Woods it was usual to grow coppice interspersed with ‘standards’ or trees, usually oak or ash, which were grown to full size for their timber value. Some of these are today’s veterans, a rank joined by the hundreds of large twin-stemmed alders, oaks and sweet chestnuts found scattered throughout the Woods. These are examples of ‘stored coppice’, where two or more poles are selected to grow on to full size to produce timber. Pollarding is equivalent to coppicing in that it is designed to encourage regrowth. However, instead of cutting back to the stump pollarding involves the careful removal of branches from the crown. Unlike coppiced trees, pollards resprout at a height well beyond the reach of grazing animals. In Britain, the technique was used in wood pastures where deer and livestock roamed. As with coppiced trees pollarding has to undertaken at regular intervals. There are some old pollards within the woods but they are infrequent. Demand for coppiced material declined throughout the early 19th century (the last recorded sale was in 1859) and timber production became more important. Many timber trees were planted in the Woods between 1824 and 1845, and again, sporadically, during the last quarter of that century. Beech, hornbeam, larch, Scot’s pine, sweet chestnut and sycamore were introduced into the Woods around this time. Sweet chestnuts from Southern Europe were chosen as a fast-growing alternative to oak; beech, a native of Southern England, was selected for its fine grain and strength. 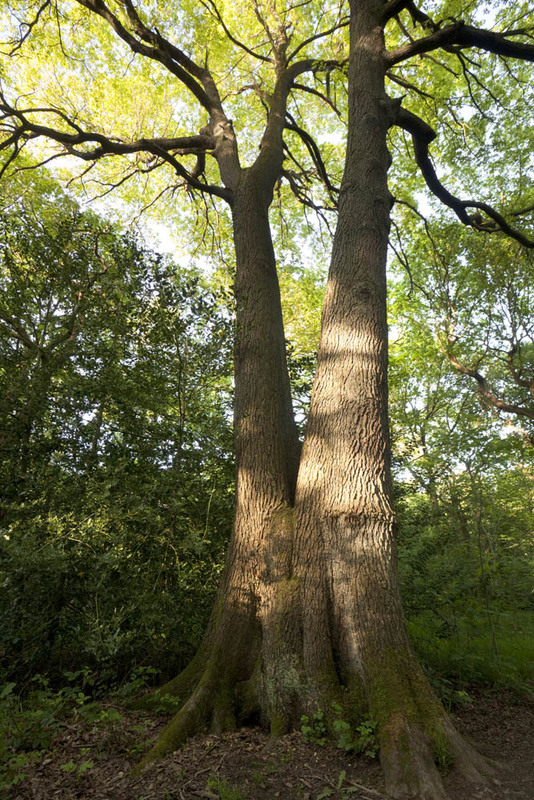 Veterans of both species are among the largest trees in the Woods, with some measuring in excess of 4m around the girth. By 1860 the character of the Woods had been transformed into a state known as ‘high forest’. Gaps left over from coppicing were planted, stored coppice grew into large trees and natural regeneration filled in much of the rest. What was once a fairly light and open environment became increasingly shady, with negative implications for biodiversity. The Woods were purchased by the Sheffield Corporation in 1927, however they remained in the same overgrown state for the next few decades. In the 1990’s the Parks and Countryside service developed a 5-year Management Plan for the Woods. Subsequent management plans – the most recent one is here – are built on the success of the first one and there has been a notable increase in biodiversity. Where foliage is dense, canopy clearings are created through selective coppicing and the straight felling of chosen trees. Where more light reaches the woodland floor tree saplings and plants have a chance to recolonise. Rangers and volunteers maintain these areas to ensure that vigorous plants like brambles and bracken do not take over. It is worth the extra effort as there are usually excellent flower displays in the first years after tree clearance. ‘Topping’ is sometimes used instead of straight felling and differs from pollarding in that it all of the crown is removed, leaving only a standing trunk or ‘snag’. In Ecclesall Woods this practice is used on very large trees, which are already showing signs of disease, or ones that are potentially dangerous. In many cases it is likely that a topped tree will regrow, although such a radical cut can introduce disease that can lead to death. Standing dead wood is an important habitat and one that is particularly favoured by woodpeckers. Decaying wood is fundamental the woodland ecosystem as it returns nutrients to the soil. 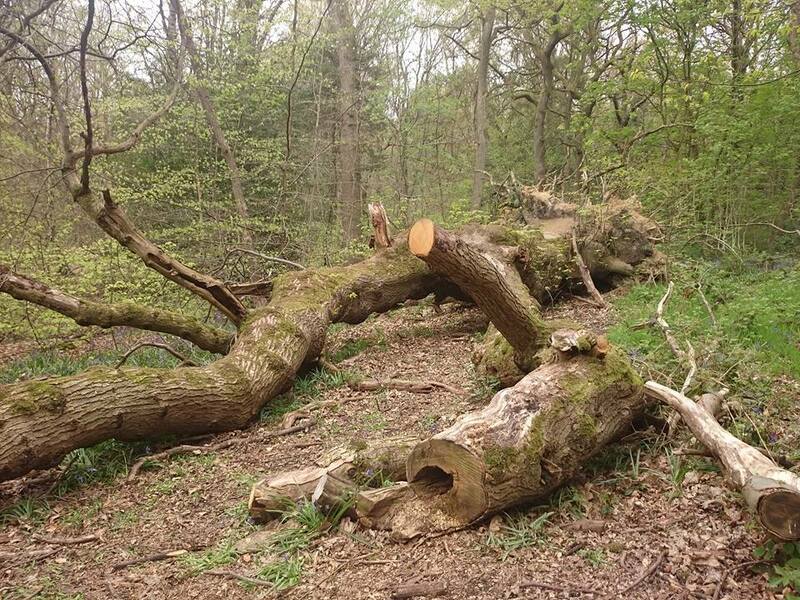 This is why fallen trees, aka ‘nurse logs’, are allowed to decay in position. What was once Ecclesall Sawmill is now the site of the J.G. Graves Woodland Discovery Centre. This is home to the Ecclesall Woods craft group who keep traditional crafts and historical management techniques alive. You can learn various woodland crafts and green woodworking skills through courses held at the centre, using material sustainably sourced from the Woods.